10 Vinyl Wall Decals Under $10! You are here: Home / Great Deals / Amazon Deals / 10 Vinyl Wall Decals Under $10! Vinyl wall decals are such a chic and economical way to decorate. 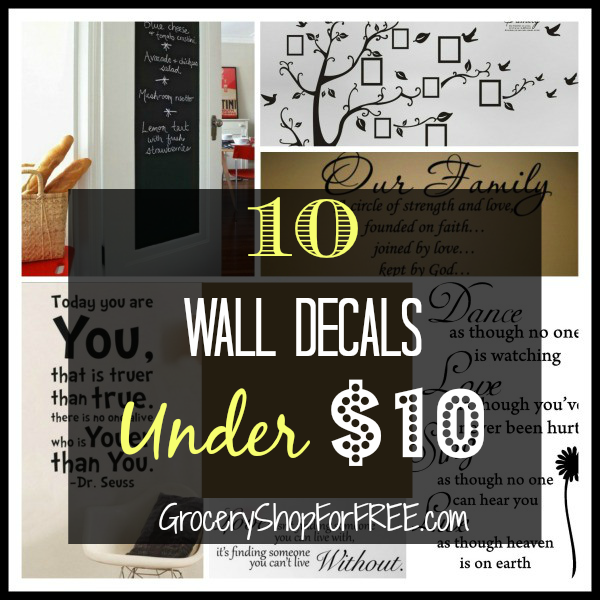 If you like them as much as I do, then you’re going to love our roundup of 10 Vinyl Wall Decals under $10! Always Kiss Me Goodnight Wall Decal – $2.11 + FREE shipping! Love Without Wall Decal – $2.51 + FREE shipping! Dance Love Sing Live Wall Decal – $3.52 + FREE shipping! Laundry Room Quote Decal – $3.91 + FREE shipping! Happy Live Laugh Love Smile Inspirational Wall Decal – $4.33 + FREE shipping! Dr Seuss Today You Are You Wall Decal – $4.72 + FREE shipping! If You Sprinkle When You Tinkle Wall Decal – $4.95 + FREE shipping! Picture Removable Wall Decor Decal Sticker – $6.69 + FREE shipping! Our Family a Circle of Strength and Love Wall Vinyl Sticker Decal – $8.37 + FREE shipping! Fancy-Fix Vinyl Blackboard Home Sticker Removable Wall Decal – $8.98 + FREE shipping!